In order to generate biofuels, insoluble cellulosic substrates are pretreated andsubsequently hydrolyzed with cellulases. One way to pretreat cellulose in a safeand environmentally friendly manner is to apply, under mild conditions,non-hydrolyzing proteins such as swollenin - naturally produced in low yields bythe fungus Trichoderma reesei. To yield sufficient swollenin forindustrial applications, the first aim of this study is to present a new way ofproducing recombinant swollenin. The main objective is to show how swolleninquantitatively affects relevant physical properties of cellulosic substrates andhow it affects subsequent hydrolysis. After expression in the yeast Kluyveromyces lactis, the resultingswollenin was purified. The adsorption parameters of the recombinant swolleninonto cellulose were quantified for the first time and were comparable to those ofindividual cellulases from T. reesei. Four different insoluble cellulosicsubstrates were then pretreated with swollenin. At first, it could bequalitatively shown by macroscopic evaluation and microscopy that swollenin causeddeagglomeration of bigger cellulose agglomerates as well as dispersion ofcellulose microfibrils (amorphogenesis). Afterwards, the effects of swollenin oncellulose particle size, maximum cellulase adsorption and cellulose crystallinitywere quantified. The pretreatment with swollenin resulted in a significantdecrease in particle size of the cellulosic substrates as well as in theircrystallinity, thereby substantially increasing maximum cellulase adsorption ontothese substrates. Subsequently, the pretreated cellulosic substrates werehydrolyzed with cellulases. Here, pretreatment of cellulosic substrates withswollenin, even in non-saturating concentrations, significantly accelerated thehydrolysis. By correlating particle size and crystallinity of the cellulosicsubstrates with initial hydrolysis rates, it could be shown that theswollenin-induced reduction in particle size and crystallinity resulted in highcellulose hydrolysis rates. Recombinant swollenin can be easily produced with the robust yeast K.lactis. Moreover, swollenin induces deagglomeration of celluloseagglomerates as well as amorphogenesis (decrystallization). For the first time,this study quantifies and elucidates in detail how swollenin affects differentcellulosic substrates and their hydrolysis. Naturally occurring lignocellulose is a promising starting material for the sustainableproduction of platform chemicals and fuels [1–6]. The hydrolysis of its main component cellulose to glucose necessitates acellulase system consisting of cellobiohydrolase (CBH, E.C. 3.2.1.91), endoglucanase(EG, E.C. 3.2.1.4) and β-glucosidase (E.C. 3.2.1.21) [7–9]. Besides enzyme-related factors (for example, enzyme inactivation and productinhibition) , the enzymatic hydrolysis of cellulose is limited by its physical properties [11–14]. These properties, in particular, are the degree of polymerization,accessibility and crystallinity [15–18]. Cellulose accessibility, which is determined by cellulose particle size(external surface area) and porosity (internal surface area) [15, 19], is the most important factor for hydrolysis [15, 18, 20–24]. This accessibility reflects the total surface area available for directphysical contact between cellulase and cellulose and, therefore, influences cellulaseadsorption as well as the rate and extent of cellulose hydrolysis [21, 25]. Furthermore, crystallinity is a relevant factor for cellulose hydrolysis,since it influences the reactivity of adsorbed cellulases . Here, it should be noted that crystallinity may also affect cellulaseadsorption [26, 27] and, therefore, cellulose accessibility [15, 21, 28]. Up to now, the relationship between crystallinity and accessibility has notbeen clearly understood [15, 29]. However, for high cellulose hydrolysis rates and yields, celluloseaccessibility needs to be increased and, conversely, its crystallinity reduced [30, 31]. To achieve this and accordingly improve subsequent hydrolysis, pretreatmenttechniques are essential [6, 14, 16, 32]. Since pretreatment can be expensive, there is a prime motivation to screen and improveit [33–37]. Over time, many pretreatment technologies have been developed: physical (forexample, milling or grinding), physicochemical (for example, steam explosion or ammoniafiber explosion), chemical (for example, acid or alkaline hydrolysis, organic solventsor ionic liquids), biological or electrical methods, or combinations of these methods [33, 35]. Some of these techniques entail expensive equipment, harsh conditions andhigh energy input . By contrast, in the past years, non-hydrolyzing proteins have beeninvestigated that pretreat cellulose under mild conditions [17, 20]. After regular lignocellulose pretreatment, these non-hydrolyzing proteinscan be added during cellulose hydrolysis  or they can be utilized in a second pretreatment step in which cellulose isthe substrate . During this second pretreatment step, cellulose is incubated under mild conditions withnon-hydrolyzing proteins that bind to the cellulose. As a result, cellulose microfibrils(diameter around 10 nm [39, 40]) are dispersed and the thicker cellulose macrofibrils or fibers (diameteraround 0.5 to 10 μm, consisting of microfibrils [39–41]) swell, thereby decreasing crystallinity and increasing accessibility [20, 42–44]. This phenomenon was named amorphogenesis [20, 42]. Furthermore, cellulose-binding proteins can lead to deagglomeration ofcellulose agglomerates (diameter > 0.1 mm, consisting of cellulose fibers) [45, 46], thereby separating cellulose fibers from each other and additionallyincreasing cellulose accessibility. Ultimately, amorphogenesis as well asdeagglomeration promote cellulose hydrolysis . Various authors have described hydrolysis-promoting effects when pretreating cellulosewith single cellulose-binding domains , expansins from plants [38, 47–49] or expansin-related proteins from Trichoderma reesei , Bacillus subtilis , Bjerkandera adusta  or Aspergillus fumigatus . 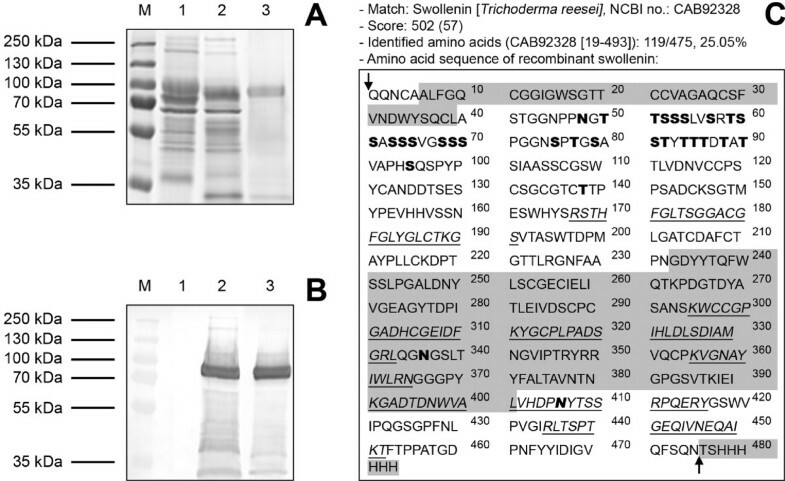 A prominent expansin-related protein is swollenin from the fungus T.reesei. In contrast to cellulases, the expression levels of swollenin in T.reesei are relatively low (1 mg/L) . Thus, swollenin from T. reesei has been heterologously expressed inSaccharomyces cerevisiae , Aspergillus niger  and Aspergillus oryzae . The expression levels in S. cerevisiae, however, are also low (25μg/L)  and only A. oryzae produces swollenin in higher concentrations (50mg/L) . According to Saloheimo et al. , swollenin can disrupt the structure of cotton fiber or the cell wall of thealgae Valonia macrophysa. Since swollenin shows a high sequence similarity toplant expansins , it may have a similar function and lead to the disruption of cellulosicnetworks within plant cell walls . Thus, swollenin may have an important role in the enzymatic degradation oflignocellulose by T. reesei . Up to now, however, there is no systematic and quantitative analysis of theeffects of swollenin on cellulosic substrates and their hydrolysis. First, this study presents an alternative way of producing recombinant swollenin inorder to generate sufficient swollenin for industrial applications. Second, the mainobjective is to show how recombinant swollenin quantitatively affects relevant physicalproperties of cellulosic substrates and how it affects their subsequent hydrolysis. Swollenin is a cellulase-related protein and consists of an N-terminalcellulose-binding domain connected by a linker region to an expansin-homologousdomain . The cDNA for swollenin from T. reesei was used as a template toclone a recombinant His-tagged swollenin (data not shown). After cloning, therecombinant swollenin was heterologously expressed by using the yeast K. lactis as expression host . In addition, a non-transformed K. lactis wild type wascultivated as a reference. As shown by SDS-PAGE (Figure 1A),the supernatants of the wild type (lane 1) and the transformed clone (lane 2) showedonly a few differences in protein secretion pattern. These differences could beexplained by the influence of heterologous protein expression on the native secretomeof K. lactis . However, an intense protein band at about 80 kDa could be observed in thesupernatant of the transformed clone which corresponds to the size of nativeswollenin from T. reesei (about 75 kDa, 49 kDa based on the primarysequence) . Furthermore, this protein band was detected as a His-tagged protein byWestern blot analysis (Figure 1B). In order to quantify theputative swollenin in the supernatant of K. lactis, the total proteinconcentration was determined and a densitometric analysis of the SDS-polyacrylamidegel (Figure 1A, lane 2) was conducted. The expression level ofswollenin was approximately 20 to 30 mg/L, which is comparable with the results forother recombinant proteins expressed in K. lactis [55, 56]. With respect to recombinant swollenin, lower or comparable expressionlevels were achieved by using S. cerevisiae (25 μg/L)  or A. oryzae (50 mg/L)  as expression hosts. Finally, this protein was purified by immobilizedmetal ion affinity chromatography. According to Figure 1A and1B, the final fraction (lane 3) showed a protein band withhigh purity (around 75%). SDS-PAGE, Western blot and mass spectrometry of swollenin produced by Kluyveromyces lactis. (A) SDS-PAGE and (B)Western blot: (M) Molecular mass marker, (1) filtrated culture supernatant ofK. lactis wild type, (2) filtrated culture supernatant of K.lactis expressing recombinant swollenin, (3) recombinant swolleninpurified by immobilized metal affinity chromatography. 12% polyacrylamide gel,the same volume of the samples (15 μL) was loaded onto the particularslots; (C) Mass spectrometric results and primary sequence ofrecombinant swollenin. The protein band (around 80 kDa) was analyzed using amass spectrometer and the Mascot database. The detected peptides are underlinedand written in italic letters. The cellulose-binding domain [6-39], expansinAdomain [243-401] and His-tag [476-483] are marked in grey. Potential areas forN-glycosylation and O-glycosylation are written in bold letters. The blackarrows enclose the primary sequence of the native swollenin (CAB92328) withoutleader peptide. To clearly identify the protein band at about 80 kDa (Figure 1Aand 1B), its amino acid sequence was determined by using massspectrometry  and the Mascot search engine . Figure 1C shows the results of mass spectrometryand the expected amino acid sequence of the recombinant swollenin. As shown by a highMascot score of 502 (Figure 1C), the protein at 80 kDa wasclearly identified to be a variant of swollenin from T. reesei. Regardingthe native swollenin sequence, a protein score of greater than 57 (homologythreshold) indicates identity or extensive homology (P < 0.05). Inaddition, potential N- and O-glycosylation sites were detected by using the NetNGlyc1.0 and NetOGlyc 3.1 servers  (Figure 1C). Here, it should be noted that thenative swollenin contains almost no N-glycosylation . Therefore, the difference between the calculated molecular mass of 49kDa, based on the primary sequence of swollenin, and the observed molecular mass of80 kDa (Figure 1A and 1B) may beexplained by O-glycosylation and other post-translational modifications. Proofs aregiven as follows: (i) the linker region of cellulases or cellulase-related proteinsis highly O-glycosylated ; (ii) swollenin contains potential O-glycosylation sites within the linkerregion (Figure 1C); (iii) no peptides of the linker region wereidentified by mass spectrometry, since glycosylation alters the mass/charge ratio ofthe peptides (Figure 1C). As the adsorption of proteins is a prerequisite for amorphogenesis , the adsorption isotherm of purified swollenin onto filter paper wasdetermined. Preliminary adsorption kinetics showed that an incubation time of lessthan or equal 2 h was needed to reach equilibrium. Figure 2illustrates that the adsorption of swollenin was a characteristic function of freeswollenin concentration. After a sharp increase in adsorbed swollenin at lowconcentrations, a plateau was reached at higher concentrations (> 5 μmol/L). Asdenatured swollenin, boiled for 20 min, showed no adsorption (Figure 2), the adsorption was specific and required a functional proteinstructure. The Langmuir isotherm (Equation 1) provided a good fit (Figure 2, R 2 = 0.91). 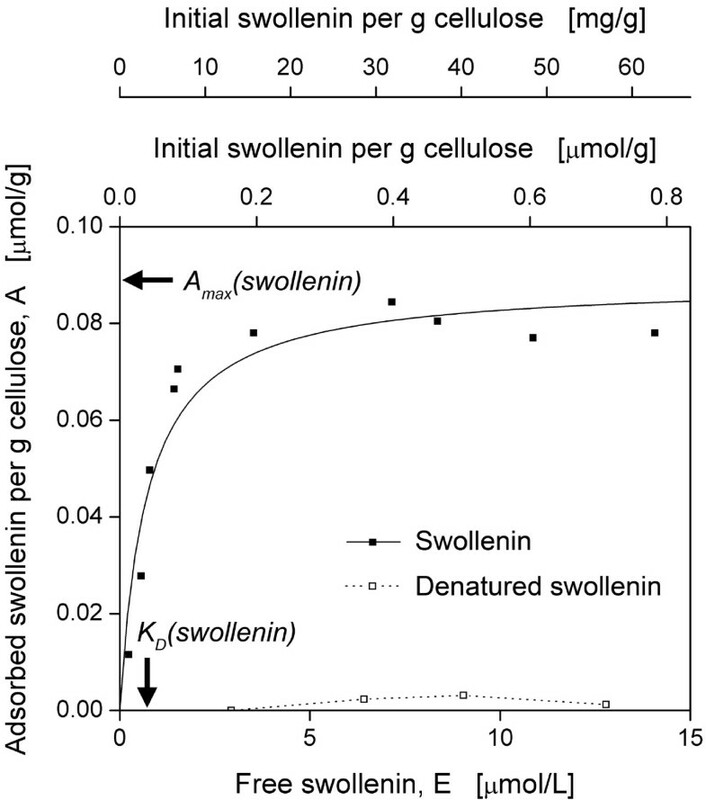 Corresponding parameters - themaximum swollenin adsorption per g cellulose at equilibrium,A max (swollenin); and the dissociation constant of swollenin,K D (swollenin) - are listed in the legend of Figure 2. Similar values of A max and K D were found when analyzing the adsorption of purified cellulases ontofilter paper (, CBH I: 0.17 μmol/g, 0.71 μmol/L; EG I: 0.17 μmol/g, 1.79μmol/L). This may be attributed to the fact that swollenin exhibits acellulose-binding domain with high homology to those of cellulases . However, A max was lower for swollenin than for singlecellulases. According to Linder et al. , single amino acid substitutions of cellulose-binding domains can lead toadsorption differences. Furthermore, catalytic domains of cellulases are known tospecifically adsorb onto cellulose independently of cellulose-binding domains . In addition, the difference in A max may be explainedby the lower molecular mass of cellulases  and, therefore, a better access to internal binding sites as described forother proteins and materials [65, 66]. Adsorption isotherm of purified swollenin onto filter paper. Thepredicted Langmuir isotherm, according to Equation (1), is shown as a solidline (R 2 = 0.91) and corresponding parameters (includingstandard deviations) are: A max (swollenin) = 0.089 ±0.006 μmol/g, K D (swollenin) = 0.707 ± 0.196μmol/L. The initial swollenin concentration, added at the start of theincubation, is also shown for a better understanding of Figure 8; 20 g/LWhatman filter paper No.1 in 0.05 M sodium acetate buffer at pH 4.8, T = 45°C, V L = 1 mL, n = 1000 rpm,d 0 = 3 mm, incubation time 2 h.
To verify a potential effect of recombinant swollenin on cellulose, filter paper waspretreated with buffer, BSA or recombinant swollenin. Here, swollenin in an initialconcentration of 20 mg per g cellulose was applied (> 80% saturation, Figure 2). It should be noted that all pretreatments were initiated withthe same initial number (80) of filter paper agglomerates (initial diameterapproximately 3 mm). As shown in Figure 3A, swollenin caused adeagglomeration of filter paper agglomerates (consisting of cellulose fibers). Sincethe cellulose fibers of a single agglomerate were separated by pretreatment withswollenin (Figure 3B), the number of bigger agglomeratesobviously decreased (Figure 3A). This decrease in the number ofbigger agglomerates (> 0.5 mm) was also quantified using image analysis (Figure 3A). During pretreatment, a shaken system with relatively lowshear forces was applied. However, to exclude a sole mechanical effect on celluloseagglomerates due to shaking and to verify a specific effect of swollenin, filterpaper was accordingly pretreated with buffer or the protein BSA (references). Bycontrast, the pretreatments with buffer or BSA showed much less deagglomeration(Figure 3A and 3B). Consequently, thedeagglomeration was specifically caused by swollenin. As no reducing sugars weredetected when using the sensitive p-hydroxy benzoic acid hydrazide assay after anincubation with swollenin for 48 h, the reduction in the number of large agglomerateswas attributed to the aforementioned adsorption of swollenin onto filter paper(Figure 2) and the so-called non-hydrolytic deagglomeration . Photography and light microscopy of filter paper after pretreatment withswollenin. (A) Macroscopic pictures of pretreated filter paper inpetri dishes and number of agglomerates. All pretreatments were initiated withthe same initial number (80) of filter paper agglomerates (initial diameterapprox. 3 mm). Number of agglomerates (> 0.5 mm) was measured by imageanalysis; (B) Light microscopy of pretreated filter paper. Eclipse E600(Nikon); Pretreatment: 20 g/L cellulose in 0.05 M sodium acetate buffer at pH4.8, 0.4 g/L BSA (approx. 6 μmol/L) or swollenin (approx. 5 μmol/L),T = 45°C, V L = 1 mL, n = 1000rpm, d 0 = 3 mm, incubation time 48 h.
As described by Saloheimo et al. , swollenin is also able to disrupt and swell cotton fibers. Thisphenomenon results from the dispersion of cellulose microfibrils and is calledamorphogenesis [20, 42]. In this current study, however, the swelling of cellulose fibers was notdetected when Whatman filter paper No.1 - a different substrate - was used (Figure3B). Reasons for this may be the different structure offilter paper than that of cotton used by Saloheimo et al. or the low resolution of light microscopy. Therefore, scanning electronmicroscopy was applied to visualize the effect of swollenin on cellulose microfibrils(Figure 4A and 4B). 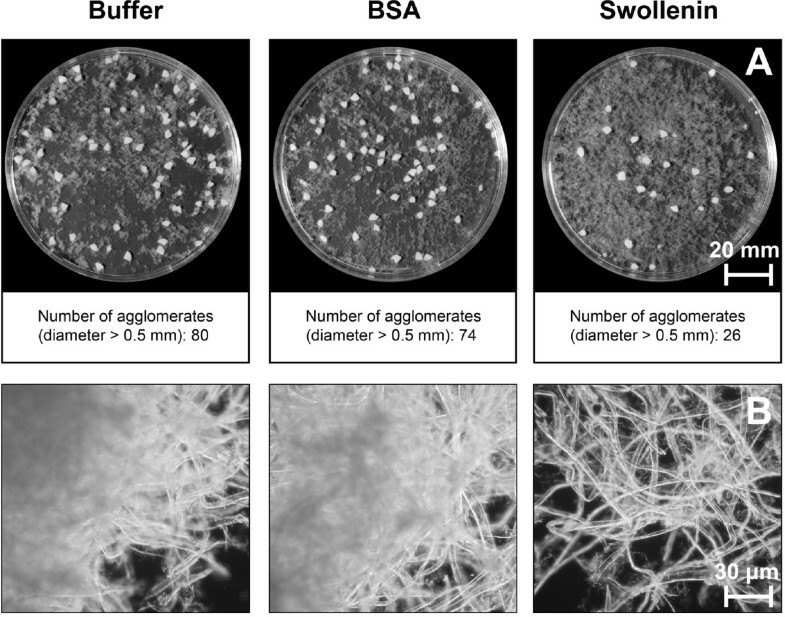 After pretreatmentswith buffer or BSA, the microfibrils were not dispersed, thereby resulting in asmooth and uniform surface of the whole fiber. By contrast, swollenin caused themicrofibrils to disperse, thereby creating a rough and amorphic surface on thecellulose fibers. Other authors found similar results via scanning electronmicroscopy after treating cellulose with cellulose-binding domains of cellulases [17, 45, 67]. However, the results of this current study indicate that recombinantswollenin from K. lactis may induce amorphogenesis of cellulosicsubstrates. Scanning electron microscopy of filter paper after pretreatment withswollenin. Pictures were taken at two different magnifications (A,B): see scale markers; Pretreatment: 20 g/L cellulose in 0.05 M sodiumacetate buffer at pH 4.8, 0.4 g/L BSA (approx. 6 μmol/L) or swollenin(approx. 5 μmol/L), T = 45°C, V L = 1 mL,n = 1000 rpm, d 0 = 3 mm, incubation time 48 h.Hitachi S-5500 (Hitachi). The non-hydrolytic deagglomeration or amorphogenesis of cellulose was also describedfor single cellulose-binding domains of cellulases [17, 45, 67] and for other expansin-related proteins from B. subtilis , A. fumigatus  or B. adusta . However, there is no detailed and quantitative analysis of differentcellulosic substrates after pretreatment with non-hydrolyzing proteins, especiallywith regard to swollenin. To analyze in detail the effect of recombinant swollenin on cellulose, differentcellulosic substrates were pretreated with buffer, BSA or recombinant swollenin.After pretreatment and removal of bound proteins, the physical properties of thepretreated cellulosic substrates were analyzed by laser diffraction, cellulaseadsorption studies and crystallinity measurements. As seen in Figure 5A-D, the cellulosic substrates showed broadand inhomogeneous particle-size distributions. Upon considering the same cellulosicsubstrate, the pretreatments with buffer or BSA led to no differences inparticle-size distributions and in the resulting geometric mean particle sizes(Figure 5E-H). After swollenin pretreatment, however, theparticle-size distributions shifted to lower values, and large cellulose agglomerateswere predominantly deagglomerated to smaller particles. The bigger the initialparticle size of the corresponding cellulosic substrate was, the greater thereduction in mean particle size by swollenin pretreatment was (filter paper >α-cellulose > Avicel). In the case of Sigmacell, all particle-size distributionswere identical (Figure 5D), and the mean particle sizes did notchange significantly due to pretreatment with swollenin (Figure 5H). This may be explained by the small initial particle size of Sigmacelland the absence of cellulose agglomerates. Particle size of cellulosic substrates after pretreatment withswollenin. 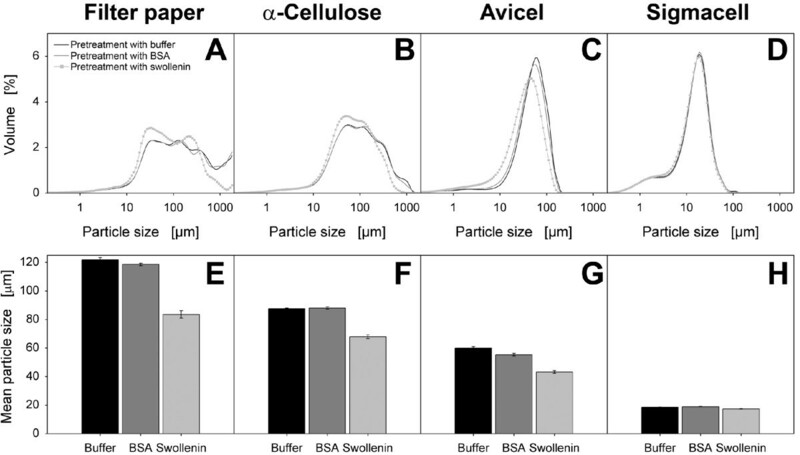 (A, B, C, D) Volumetric particle-size distribution ofpretreated cellulosic substrates: (A) Whatman filter paper No.1;(B) α-Cellulose; (C) Avicel PH101; (D) Sigmacell101; (E, F, G, H) Geometric mean particle size of pretreated cellulosicsubstrates: (E) Whatman filter paper No.1; (F) α-Cellulose;(G) Avicel PH101; (H) Sigmacell 101. Errors are given asstandard deviations; Pretreatment: 20 g/L cellulose in 0.05 M sodium acetatebuffer at pH 4.8, 0.4 g/L BSA (approx. 6 μmol/L) or 0.4 g/L swollenin(approx. 5 μmol/L), T = 45°C, V L = 1 mL,n = 1000 rpm, d 0 = 3 mm, incubation time 48 h.Particles (< 2 mm) were analyzed using the particle size analyzer LS13320(Beckman Coulter). Since cellulosic particle sizes (external surface areas) influence celluloseaccessibility [15, 19], they also affect the adsorption of cellulases [21, 25] and they are an indication for the maximum cellulase adsorption . 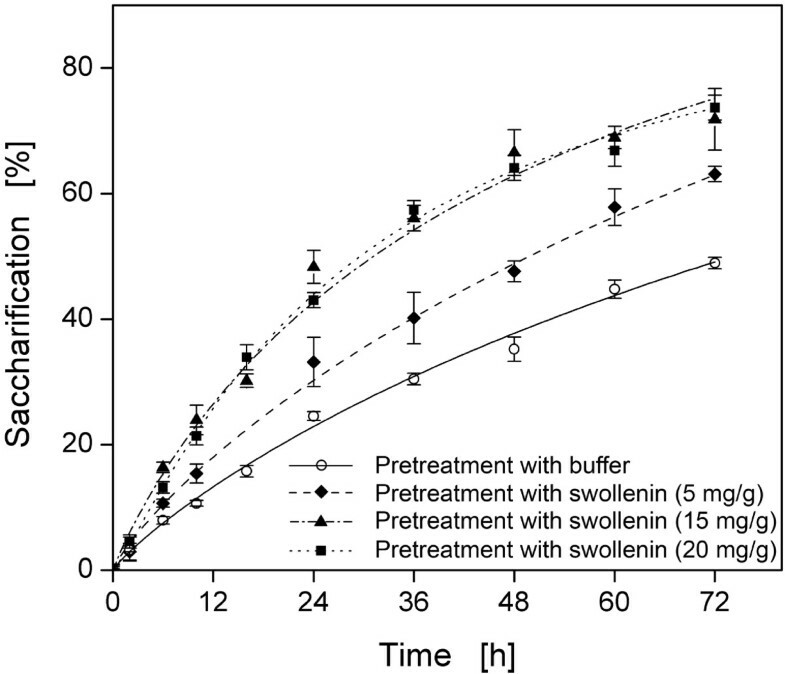 To investigate if swollenin pretreatment actually affected celluloseaccessibility, cellulase adsorption was analyzed after pretreatment with buffer orswollenin. According to various authors, the adsorption of total cellulase mixturesis not interpretable by simple Langmuir isotherms due to multicomponent cellulaseadsorption [10, 68]. Consequently, only the maximum cellulase adsorption per g celluloseA max (cellulase) was determined by applying differentincubation times and a total cellulase mixture at high concentrations. Since nofurther increase in cellulase adsorption was detected after 1.5 h (data not shown),adsorption equilibrium was verified. According to the literature, cellulaseadsorption is rapid and adsorption equilibrium is usually reached within 0.5 to 1.5 h [41, 64]. Saturation of all applied cellulosic substrates was reached when usingthe following cellulase/cellulose ratios: ≥ 100 mg/g (in the case of filterpaper or α-cellulose), ≥ 150 mg/g (Avicel), ≥ 200 mg/g (Sigmacell).Table 1 summarizes the maximum cellulase adsorption per gcellulose (adsorption capacity) onto all applied cellulosic substrates afterpretreatment with buffer or swollenin. In general, the determinedA max (cellulase) values are consistent with the adsorption datareported in the literature [10, 41, 69]. However, the pretreatment with swollenin caused a significant increase inmaximum cellulase adsorption except for Sigmacell. The relative increase in cellulaseadsorption between the pretreatment with swollenin and the pretreatment with buffer(filter paper > α-cellulose > Avicel > Sigmacell) showed a similar series as therelative reduction in mean particle size (filter paper > Avicel > α-cellulose >Sigmacell; Figure 5). Consequently, the increase in adsorptioncapacities of the swollenin-pretreated samples resulted primarily from the reductionin particle size and the corresponding increase in cellulose accessibility. However,in the case of α-cellulose, the increase in maximum cellulase adsorption wasdisproportionately higher. This can be explained by the effect of swollenin on otherphysical properties of cellulose, such as crystallinity, which may influencecellulase adsorption according to various authors [26, 27]. Moreover, since all applied cellulosic substrates do not contain lignin,its influence on cellulose accessibility [31, 70–72] could be neglected. Maximum cellulase adsorption onto cellulosic substrates after pretreatment withswollenin. The coefficients of variation were below 7.5% for each value.A max (cellulase) denotes the maximum cellulaseadsorption per g cellulose at equilibrium. To additionally determine the influence of swollenin on the crystallinity ofcellulose, the crystallinity index (CrI) of all pretreated cellulosicsubstrates was analyzed by X-ray diffraction (XRD) measurements (Figure 6A-D). A recrystallization of cellulose by incubation with aqueoussolutions [73, 74] was not observed, because the initial CrI of untreated substrateswas higher than that of cellulosic substrates treated with buffer (data not shown).As illustrated by Figure 6, the pretreatment with buffer or BSAcaused no differences in CrI; the CrI values were identical uponconsidering the same cellulosic substrate. By contrast, swollenin pretreatmentspecifically reduced the CrI as follows: filter paper (-10%),α-cellulose (-22%) and Avicel (-13%). However, in the case of Sigmacell, noeffect of swollenin pretreatment on CrI was detected (Figure 6D) which can be explained by the low initial CrI and theamorphous structure of Sigmacell . The strongest reduction in CrI was recorded in the case ofα-cellulose (Figure 6B). Since α-cellulose is fibrous  and can consist of up to 22% xylan , it may be more sensitive to non-hydrolytic decrystallization . However, the strong reduction in the CrI of α-celluloseexplains the disproportionate increase in maximum cellulase adsorption ontoα-cellulose (Table 1), since cellulase adsorption canincrease with decreasing CrI . As reported in the literature, similar reductions in crystallinity werefound by using other non-hydrolyzing proteins: (i) the CrI of Aviceldecreased by 9% to 12% after pretreatment with single cellulose-binding domains ; (ii) the CrI of filter paper decreased by 11.8% afterpretreatment with Zea h, a protein from postharvest corn stover . Up to now, however, the influence of swollenin on the CrI ofdifferent cellulosic substrates has not been quantified. Therefore, this studyprovides the first proof that swollenin does induce deagglomeration of celluloseagglomerates as well as amorphogenesis (decrystallization) [20, 42]. Crystallinity index of cellulosic substrates after pretreatment withswollenin. (A) Whatman filter paper No.1; (B)α-Cellulose; (C) Avicel PH101; (D) Sigmacell 101. Errors aregiven as standard deviations; Pretreatment: 20 g/L cellulose in 0.05 M sodiumacetate buffer at pH 4.8, 0.4 g/L BSA (approx. 6 μmol/L) or 0.4 g/Lswollenin (approx. 5 μmol/L), T = 45°C, V L = 1 mL, n = 1000 rpm, d 0 = 3 mm,incubation time 48 h. Powder XRD (STOE & Cie GmbH). Upon using the same cellulase mixture, enzymatic hydrolysis rates are especiallyaffected by the physical properties of the applied cellulose [10, 14]. Since swollenin pretreatment affected cellulose particle size and maximumcellulase adsorption as well as crystallinity, the resulting effects on subsequenthydrolysis of all pretreated cellulosic substrates were analyzed by using rebufferedCelluclast®. As shown in Figure 7A-C,swollenin pretreatment significantly accelerated cellulose hydrolysis, and thesaccharification after 72 h was increased. 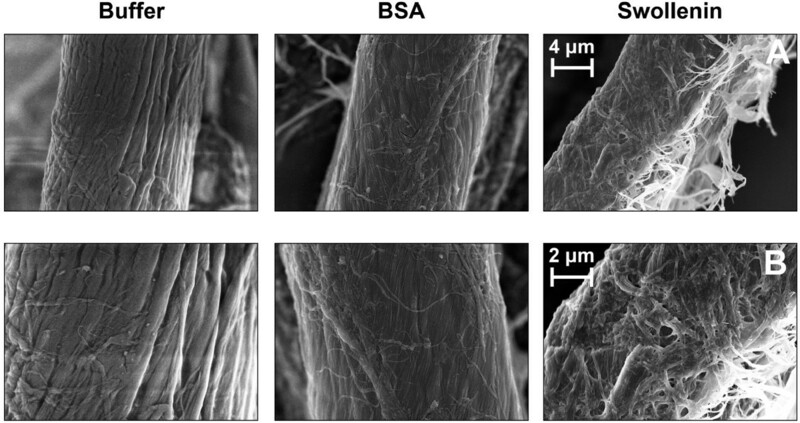 In contrast, the corresponding hydrolysiscurves for buffer and BSA were almost the same by comparing the same cellulosicsubstrate. This is attributed to the fact that pretreatment with buffer and BSA hadno significant effect on particle size (Figure 5), maximumcellulase adsorption (Table 1) or on CrI (Figure 6). In the case of filter paper (Figure 7A),the hydrolysis-accelerating effect of swollenin pretreatment was stronger than thatfor α-cellulose (Figure 7B) and Avicel (Figure 7C). This may be explained by the substantial decrease in meanparticle size (Figure 5) and the strong increase in maximumcellulase adsorption (Table 1) for filter paper by swolleninpretreatment. Figure 7D shows that the hydrolysis curves ofSigmacell were almost the same, since swollenin pretreatment did not change thephysical properties of Sigmacell. 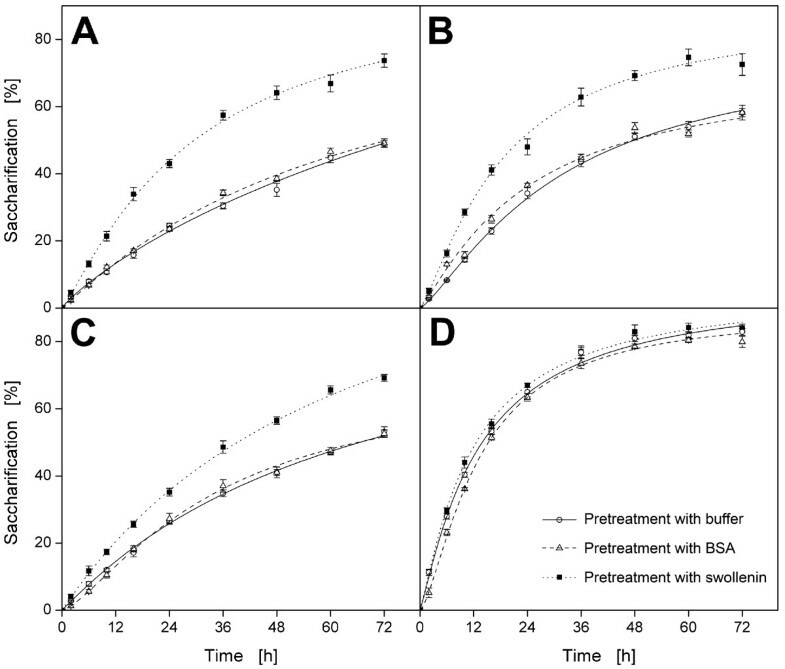 Hydrolysis of cellulosic substrates after pretreatment with swollenin. (A) Whatman filter paper No.1; (B) α-Cellulose;(C) Avicel PH101; (D) Sigmacell 101. Errors are given as standarddeviations; Pretreatment: 20 g/L cellulose in 0.05 M sodium acetate buffer atpH 4.8, 0.4 g/L BSA (approx. 6 μmol/L) or 0.4 g/L swollenin (approx. 5μmol/L), T = 45°C, V L = 1 mL,n = 1000 rpm, d 0 = 3 mm, incubation time 48 h;Hydrolysis: 10 g/L pretreated cellulose in 0.05 M sodium acetate buffer at pH4.8, 1 g/L rebuffered Celluclast®, T = 45°C,V L = 1 mL, n = 1000 rpm, d 0 = 3 mm. Furthermore, the relationship between the hydrolysis-accelerating effect and theamount of swollenin applied during pretreatment was investigated (Figure 8). Compared to the aforementioned experiments (Figure 7 and 8; 20 mg swollenin per g cellulose),less swollenin (5 mg per g cellulose) caused a less accelerated hydrolysis and thefinal concentration of reducing sugars was 0.85-fold smaller. However, when theamount of swollenin was decreased merely from 20 mg/g to 15 mg/g, the same reducingsugar concentration was detected after 72 h. Since maximum swollenin adsorption wasreached at higher initial swollenin concentrations (> 60 mg/g for 95% saturation,Figure 2), these results show that even non-saturatingswollenin concentrations of 15 to 20 mg/g are sufficient for a maximumhydrolysis-accelerating effect. This may be explained as follows: (i) not allaccessible cellulose-binding sites must be occupied for a maximumhydrolysis-accelerating effect; (ii) swollenin reversibly binds to cellulose, therebyperforming further deagglomeration and amorphogenesis at multiple cellulose-bindingsites. The reversible adsorption onto cellulose-binding sites was already reportedfor cellulases containing cellulose-binding domains . Hydrolysis of filter paper after pretreatment with different swolleninconcentrations. Errors are given as standard deviations; Pretreatment:20 g/L Whatman filter paper No.1 in 0.05 M sodium acetate buffer at pH 4.8,different concentrations of swollenin, T = 45°C,V L = 1 mL, n = 1000 rpm,d 0 = 3 mm, incubation time 48 h; Hydrolysis: 10 g/Lpretreated cellulose in 0.05 M sodium acetate buffer at pH 4.8, 1 g/Lrebuffered Celluclast®, T = 45°C, V L = 1 mL, n = 1000 rpm, d 0 = 3 mm. Finally, an empirical correlation for initial hydrolysis rates based on CrI and mean particle size was determined for the pretreated cellulosic substrates(Figure 9). In this investigation, the correlation showed thatthe swollenin-induced reduction in CrI and particle size resulted in highcellulose hydrolysis rates. Furthermore, Figure 9 illustratesthe aforementioned differences in cellulose hydrolysis rates (Figure 7) for various substrates and pretreatments. In addition, it confirms thefindings of other authors: (i) since smaller cellulose particle sizes lead toincreased cellulase adsorption  (see previous section), hydrolysis rates increase with decreasingcellulose particle size [22–24]; (ii) since a reduction in CrI leads to increased cellulaseadsorption and higher reactivity of adsorbed cellulases, hydrolysis rates correlateinversely with the CrI of the applied cellulose [24, 26]. It should be noted that Figure 9 shows an empiricalcorrelation for the conducted hydrolysis experiments. By applying otherconcentrations or types of cellulases and cellulosic substrates, different physicalproperties of the substrate (for example, porosity, ) might predominate. Influence of crystallinity and mean particle size on hydrolysis ofcellulosic substrates. 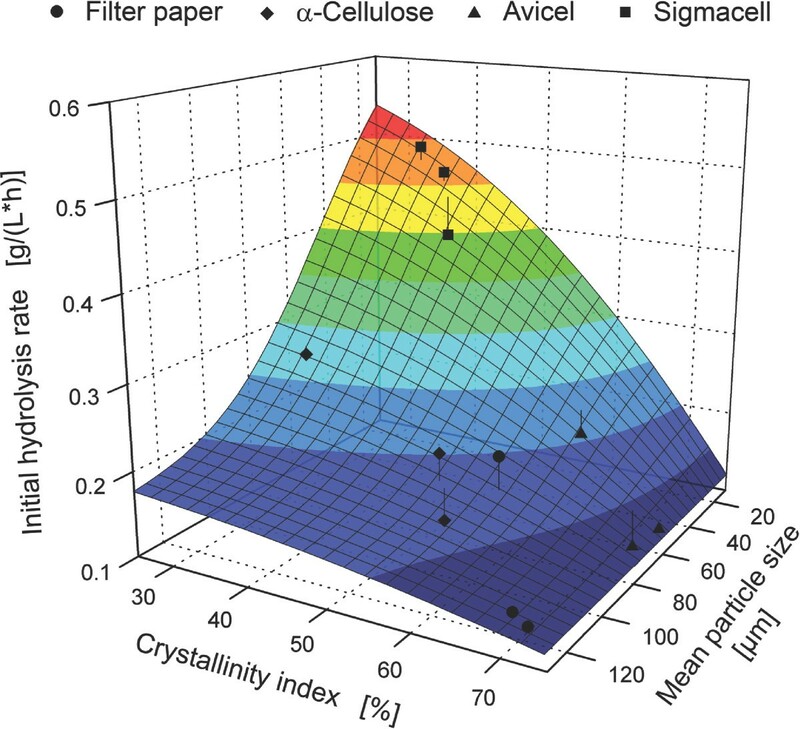 Data points for cellulosic substrates wereobtained from Figure 5 (mean particle size), Figure 6 (crystallinity index) andFigure 7 (initial hydrolysis rate from 0 to 6 h). TableCurve 3D was used todetermine an empirical surface fit (R 2 = 0.93) based on anon-linear Gaussian cumulative function. Recombinant swollenin was easily produced with the yeast K. lactis and purifiedby affinity chromatography. Additionally, the adsorption of swollenin onto cellulose wasquantified for the first time, and its adsorption parameters were comparable to those ofindividual cellulases. The pretreatment with swollenin caused a significant decrease inparticle size as well as in crystallinity of the cellulosic substrates, therebysubstantially increasing maximum cellulase adsorption. Moreover, pretreatment of thecellulosic substrates with swollenin - even in non-saturating concentrations -significantly accelerated the hydrolysis. By correlating particle size and crystallinitywith initial hydrolysis rates, it could be shown that high initial hydrolysis ratesresulted from the swollenin-induced reduction in particle size and crystallinity.Consequently, this study shows an efficient means to produce recombinant swollenin withthe robust yeast K. lactis. Moreover, this study shows that swollenin inducesdeagglomeration of cellulose agglomerates as well as amorphogenesis (decrystallization).For the first time, this study quantifies and elucidates in detail how swollenin affectscellulosic substrates and their hydrolysis. A pretreatment of cellulosic substrates has been presented here which is simply based onthe incubation of recombinant swollenin under mild conditions. Since the enzymatichydrolysis of cellulose is a rate-limiting processing step in biorefineries , this pretreatment could significantly improve hydrolysis rates. To excludepossible side effects between swollenin and cellulase, swollenin pretreatment wasperformed as a separate step within this study. In future studies, swollenin should bedirectly added during cellulose hydrolysis. Since standard assays are missing fordeagglomeration, amorphogenesis and for the comparison of different non-hydrolyzingproteins, this study may serve as an initial means to establish such assays. The cellulosic substrates Whatman filter paper No.1, α-cellulose, Avicel PH101and Sigmacell 101 were purchased from Sigma-Aldrich (MO, USA). Physical propertiesand product information have been summarized by various authors [10, 64]. Agglomerates of Whatman filter paper No.1 were prepared by using ahole-punch and quartering the resulting filter paper discs. The final filter paperagglomerates had an average diameter of approximately 3 mm. The cellulase preparationCelluclast® 1.5 L (Novozymes, Bagsværd, DK) - a filtratedculture supernatant of T. reesei  - was used for the hydrolysis of the pretreated cellulosic substrates.According to various authors, Celluclast® contains CBHs (Cel7A andCel6A), EGs (for example, Cel7B and Cel5A) as well as β-glucosidases [81, 82]. To remove salts, sugars and other interfering components,Celluclast® was previously rebuffered with an Äkta FPLC (GEHealthcare, Little Chalfont, UK). Celluclast® was loaded on SephadexG-25 Fine (2.6 cm × 10 cm, GE Healthcare), and 0.05 M sodium acetate (pH 4.8)was used as a running buffer at 110 cm/h. Sephadex G-25 Fine exhibits an exclusionlimit of 1-5 kDa which is comparable to the molecular mass cut-off of dialysismembranes for protein desalting. Since cellulases have a molecular mass of > 25 kDa [62, 83, 84], the mixture of cellulases was not changed during rebuffering.Chromatography was conducted at room temperature, and the automatically collectedfractions were directly cooled at 4°C. To determine specific filter paperactivities, different dilutions of Celluclast® and the rebufferedCelluclast® - applied for all hydrolysis experiments - were testedaccording to Ghose . Here, the following specific filter paper activities (per g protein) weremeasured: 201 U/g (Celluclast®) and 279 U/g (rebufferedCelluclast®). The below-mentioned cloning procedure was designed for secreted protein expressionaccording to the K. lactis Protein Expression Kit (New England Biolabs, MA,USA). The cDNA of the swollenin-coding region was synthesized byreverse-transcription PCR using mRNA isolated from T. reesei QM9414 (swo1gene [GenBank: AJ245918], protein sequence [GenBank: CAB92328]) and reverse transcriptase (M-MLV,Promega, WI, USA) according to the manufacturer's protocol. Specific primers wereapplied to synthesize a cDNA starting from the 19th codon of theswollenin-coding region and, therefore, missing the secretion signal sequence ofT. reesei . By using the aforementioned primers, SalI and SpeI restriction sites wereadded upstream and downstream of the swollenin-coding region, respectively. Theamplified cDNA was cloned into the pCR2.1-TOPO vector (Invitrogen, CA, USA) accordingto the manufacturer's protocol. After DNA sequencing and isolation of a correctclone, the DNA was excised from pCR2.1-TOPO and cloned into the pKLAC1-H vector usingXhoI and SpeI restriction enzymes (New England Biolabs, MA, USA) according to themanufacturer's protocol. The pKLAC1-H is a modified version of the integrative pKLAC1vector (New England Biolabs; [GenBank: AY968582]). The pKLAC1 - developed by Colussi andTaron  - exhibits the α-mating factor signal sequence and can be used forthe expression and secretion of recombinant proteins in K. lactis . The pKLAC1-H was constructed by including an additional SpeI restrictionsite directly followed by a His-tag coding sequence (6xHis) between the XhoI andAvrII restriction sites of pKLAC1. The DNA sequence of the final pKLAC1-H construct(containing the DNA coding for recombinant swollenin) is shown in Additional file1. Moreover, the final amino acid sequence ofrecombinant swollenin (without the α-mating factor signal sequence) is given inFigure 1C. All below-mentioned transformation, selection and precultivation procedures -developed by Colussi and Taron  - were performed according to the manufacturer's protocol (K. lactis Protein Expression Kit, New England Biolabs). After cloning, K. lactis GG799 cells were transformed with pKLAC1-H (containing the DNA coding forrecombinant swollenin), and transformed clones were selected (acetamide selection).One clone was precultivated in YPGal (yeast extract, peptone and galactose) medium,consisting of 20 g/L galactose, 20 g/L peptone and 10 g/L yeast extract - all mediacomponents were purchased from Carl Roth (Karlsruhe, Germany). After inoculation with2.5 mL of the preculture, the main culture was cultivated in triplicates in 2 LErlenmeyer flasks with YPGal medium under the following constant conditions:temperature T = 30°C, total filling volume V L = 250mL, shaking diameter d 0 = 50 mm, shaking frequency n =200 rpm. Additionally, a non-transformed K. lactis wild type was cultivatedas a reference. After incubation for 72 h, the main cultures were centrifuged (6000g, 20 min, 4°C), and the pooled supernatants of the triplicates were treatedwith endoglycosidase Hf by using 20 U per μg protein for 12 h  according to the manufacturer's protocol without denaturation (New EnglandBiolabs). Afterwards, the protein solution was concentrated 100-fold at 4°Cusing a Vivacell 100 ultrafiltration system with a molecular mass cut-off of 10 kDa(Sartorius Stedim Biotech, Göttingen, Germany). For affinity chromatography, therecombinant swollenin was previously rebuffered using Sephadex G-25 Fine (2.6 cm× 10 cm, GE Healthcare) at 110 cm/h with a running buffer (pH 7.4) consisting of0.05 M sodium dihydrogen phosphate, 0.3 M sodium chloride and 0.01 M imidazole. Therebuffered sample was loaded on Ni Sepharose 6 Fast Flow (1.6 cm × 10 cm; GEHealthcare) at 120 cm/h. The bound swollenin was eluted with the aforementionedrunning buffer, containing 0.25 M imidazole. SDS-PAGE and Western blot analysis were applied to analyze the purity and to identifythe recombinant swollenin. Novex 12% polyacrylamide Tris-Glycine gels (Invitrogen),and samples were prepared according to the manufacturer's protocol. The PlusPrestained Protein Ladder (Fermentas, Burlington, CA, USA) was used as a molecularmass marker. Finally, the proteins were stained with Coomassie Brilliant Blue andanalyzed densitometrically  using the scanner Perfection V700 (Epson, Suwa, Japan). The molecular massand purity of swollenin was determined using the software TotalLab TL100 (NonlinearDynamics, Newcastle, UK). For Western blot analysis, gels were blotted onto anitrocellulose membrane (Whatman, Springfield Mill, UK) according to themanufacturer's protocol (Invitrogen). The membranes were blocked at room temperaturewith 50 g/L skim milk dissolved in phosphate buffered saline containing 0.5 g/LTween-20 (PBST) for 30 min. To detect the recombinant swollenin, the membranes wereincubated at room temperature for 1.5 h with a rabbit polyclonal antibody againstHis-tag (Dianova, Hamburg, Germany) diluted 1:10,000 in PBST. After the membrane waswashed thrice with PBST, it was incubated with alkaline phosphatase conjugated goatanti-rabbit IgG (Dianova) diluted 1:5,000 in PBST at room temperature for 1 h.Finally, bound antibodies were visualized by incubating the membrane for 5 min withnitro blue tetrazolium/5-Bromo-4-chloro-3-indolyl phosphate (NBT/BCIP) diluted 1:100in phosphatase buffer (100 mM Tris-HCl, 100 mM NaCl, 5 mM MgCl2, pH9.6). Protein concentrations were analyzed with the bicinchoninic acid assay  using the BCA Protein Assay Kit (Thermo Fisher Scientific, MA, USA) andBSA as a standard. Depending on the protein concentration of the samples, thestandard procedure (working range: 0.02 to 2 g/L) or the enhanced procedure (workingrange: 0.005 to 0.25 g/L) was performed according to the manufacturer's protocol. Theabsorbance at 562 nm was measured with a Synergy 4 microtiter plate reader (BioTekInstruments, VT, USA). To quantify swollenin in the culture supernatant of K.lactis, the bicinchoninic acid assay was combined with the aforementionedSDS-PAGE (including densitometric analysis). Here, total protein concentrations weredetermined and multiplied with the ratio of swollenin to total protein (purity). Mass spectrometry was applied to identify the expressed and purified recombinantswollenin. The protein band (approximately 80 kDa) was excised from theSDS-polyacrylamide gel, washed in water, reduced with dithiothreitol, alkylated withiodoacetamide, and digested with trypsin . Peptide analysis was carried out using a nanoHPLC (Dionex, Germering,Germany) coupled to an ESI-QUAD-TOF-2 mass spectrometer (Waters Micromass, Eschborn,Germany) as previously described . The Mascot algorithm (Matrix Science, London, UK) was used to correlatethe mass spectrometry data with amino acid sequences in the Swissprot database.Thereby, the sequences of the analyzed peptides could be identified, and, ultimately,protein matches could be determined. The Mascot score is derived from the ions scoresof the detected peptides matching the peptides in the database and reflects anon-probabilistic basis for ranking protein hits . By using this database, the peptide mass tolerance was set at ± 0.3Da. Additionally, the following modifications to the amino acids in brackets wereallowed: carbamidomethyl (C), carboxymethyl (C), oxidation (M), propionamide (C).Moreover, potential areas for N-glycosylation and O-glycosylation were identified byusing the NetNGlyc 1.0 and NetOGlyc 3.1 servershttp://www.cbs.dtu.dk/services/. in which A denotes the amount of adsorbed protein per g cellulose(μmol/g), A max , the maximum protein adsorption per gcellulose at equilibrium (μmol/g), E, the free protein concentration(μmol/L), and K D , the dissociation constant (μmol/L).Within the literature , the association constant K A (L/μmol) issometimes used instead of the dissociation constant K D .
To analyze the effect of swollenin pretreatment (see below) on cellulase adsorption [44, 93], the maximum cellulase adsorption was also determined by incubatingvarious concentrations (0.7 to 2.5 g/L) of rebuffered Celluclast® with 10 g/L pretreated cellulosic substrates. Here, all incubations wereconducted under the aforementioned conditions for 1 h, 1.5 h and 2 h.
Pretreatment experiments were performed with 20 g/L cellulosic substrates and variousconcentrations of swollenin in 0.05 M sodium acetate buffer (pH 4.8). The mixtureswere incubated as triplicates in 2 mL Eppendorf tubes on a thermomixer under thefollowing constant conditions: T = 45°C, V L = 1 mL,d 0 = 3 mm, n = 1000 rpm. To exclude a solemechanical effect on cellulosic substrates due to shaking and to verify a specificeffect of swollenin, blanks without swollenin (buffer) or with 0.4 g/L BSA instead ofswollenin were incubated similarly. To detect a possible hydrolytic activity ofrecombinant swollenin, the sensitive p-hydroxy benzoic acid hydrazide assay  was applied by using glucose as a standard. After incubation for 48 h, thesupernatants of the pretreatment solution were analyzed and the absorbancies weremeasured at 410 nm in a Synergy 4 microtiter plate reader. Subsequently, allcellulosic samples were washed to remove adsorbed proteins. Therefore, the mixtureswere centrifuged (14,000 × g, 10 min, 4°C), and the cellulosicpellets were washed four times with 800 μL 0.05 M citrate buffer (pH 10) , and once with 800 μL distilled water. Finally, the triplicates werepooled. According to Zhu et al. , citrate buffer (pH 10) is an appropriate washing solution, and a singlewashing step with 0.05 M citrate buffer (pH 10) leads to a desorption efficiency of61% in case of fungal cellulases and Avicel. Since no acids or bases are formedduring the washing procedure, the weak buffer capacity of citrate buffer at pH 10 canbe neglected. In this study, the washing procedure was conducted four times to ensurea high desorption of swollenin. The measurements of protein concentration in thewashing supernatants - by applying the aforementioned bicinchoninic acid assay(working range starting from 0.005 g/L) - showed that swollenin desorbed almostcompletely. Already after three washing steps, a total swollenin desorptionefficiency of > 90% was achieved. Photography and microscopy were applied to visualize the effect of swolleninpretreatment on filter paper. After pretreatment with buffer, BSA or swollenin, thedifferent filter paper solutions were transferred into petri dishes, the particleswere evenly distributed and images were taken with an Exilim EX-FH100 camera (Casio,Tokyo, Japan). Afterwards, the number of filter paper agglomerates (> 0.5 mm) wasdetermined by image analysis using the software UTHSCSA ImageTool 3.0 (freeware) anda ruler as a reference. Light microscopic pictures were taken with an Eclipse E600(Nikon, Tokyo, Japan). Additionally, scanning electron microscopy was performed usinga Hitachi S-5500 (Hitachi, Tokyo, Japan) and a field emission of 5 kV. All washedfilter paper samples were covered with a layer of carbon (3 nm) and, subsequently,with a layer of PtPd (3 nm, 80% to 20%). The images were taken by using secondaryelectrons. where I 002 is the maximum intensity of the crystalline plane(002) reflection (2θ = 22.5°) and I AM is theintensity of the scattering for the amorphous component at about 18° incellulose-I . Here, it should be noted that there are several methods for calculatingCrI from XRD data and these methods can provide significantly differentresults [28, 70]. Although the applied peak height method produces CrI values thatare higher than those of other methods, it is still the most commonly used method andranks CrI values in the same order as the other methods . Hydrolysis experiments with 10 g/L pretreated cellulosic substrate and 1 g/Lrebuffered Celluclast® were conducted in 0.05 M sodium acetate buffer(pH 4.8). The mixtures were incubated as triplicates in 2 mL Eppendorf tubes on athermomixer under the following constant conditions: T = 45°C, totalfilling V L = 1 mL, d 0 = 3 mm, n =1000 rpm. In general, attention has to be paid to cellulase inactivation, which wouldreduce the final yield of cellulose hydrolysis . In this current study, however, a shaken system with relatively low shearforces was applied. According to Engel et al. , rebuffered Celluclast® is stable under the appliedincubation conditions, so that cellulase inactivation could be neglected. The shakingfrequency was chosen to ensure the complete suspension of cellulose particles [64, 91]. Thus, mass transfer limitations are excluded, and the whole celluloseparticle surface becomes accessible to the cellulases, thereby optimizing cellulaseadsorption and activity . Three different blanks were incubated similarly: (i) without cellulase,(ii) without substrate, or (iii) without substrate and without cellulase. Thedinitrosalicylic acid assay  was applied to quantify the reducing sugars released during hydrolysis byusing glucose as a standard. After defined time intervals, samples were taken, andthe hydrolysis was stopped (10 min, 100°C). According to Wood and Bhat , low reducing sugar concentrations were quantified by adding 1.25 g/Lglucose to the samples. The absorbancies were measured at 540 nm in a Synergy 4microtiter plate reader. Since the dinitrosalicylic acid assay exhibits a lowersensitivity towards cellobiose than glucose, reducing sugar concentrations may beunderestimated when glucose is used as a standard and β-glucosidase is not inexcess . However, under the applied hydrolysis conditions, cellobiose did notaccumulate (the highest cellobiose to glucose ratio was measured in the case ofSigmacell after 10 h at 0.12) and, therefore, this underestimation was minimal andthe addition of β-glucosidase was not needed. Initial hydrolysis rates (g/(L*h))were calculated by applying a linear fit to the reducing sugar concentration datafrom 0 to 6 h.
in which a, b, c, d, e, f and g denote the various fittingparameters of the non-linear Gaussian cumulative function (-). Gernot Jäger, Michele Girfoglio contributed equally to this work. mediumcontaining yeast extract, peptone and galactose. This work was performed as part of the Cluster of Excellence "Tailor-Made Fuels fromBiomass", which is funded by the Excellence Initiative by the German federal andstate governments to promote science and research at German universities. GJ designed and carried out experiments, analyzed results and wrote the manuscript. MGcarried out the cloning of swollenin. FD carried out the pretreatment with swollenin(incl. analysis) and subsequent hydrolysis. RR carried out the measurements ofCrI. HB carried out scanning electron microscopy. UC and AS reviewed themanuscript. RF and JB coordinated the study and reviewed the manuscript. All authorsread and approved the final manuscript.